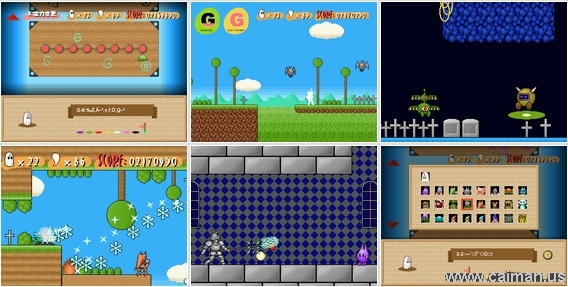 Caiman free games: Obake by Samona. This is quite unique game. You control Ghost (Obake in japanese) which can only jump, but can attack. In order to use attack you need to obtain your enemie bodies. 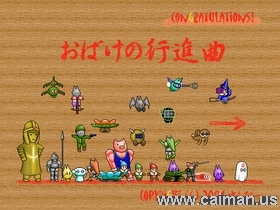 That is where the game shines, you can obtain 25 types of enemies all with diferent abilites. It is quite easy game. But if it is not enough for you you may try to obtain all hidden "G" letters and unlock secret world. Some letter are only posible to find only when you completed all 8 world and have acces to all charachters. Note: after you completed game you may choose any charachter in any room press X in room selection. Super Arab 2 : The Stor.